Designed to draw attention to any crisis, our 130db Personal Alarm is as loud as eight 100db alarms combined! The alarm is activated when the strap attached to the alarm pin is pulled. It travels easily on your belt or in your purse. 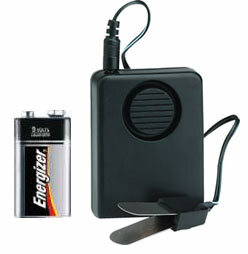 The Door Alarm accessory converts the personal alarm into a portable door or window alarm. Great for home, hotel rooms, college dorms, etc. This alarm requires one 9-volt battery. Add one or more batteries for only $2.50 apiece ($0.50 apiece less than Wal-mart). This 130db Door Alarm can be delivered in 3 to 5 business days. If you would like to receive your order sooner, guaranteed 3 day, 2 day and next day delivery options are available upon checkout. Orders placed by 2:00 PM central time ship the day they are placed. If you have any questions or concerns call our customer support staff at 800.960.2015 or click the live chat button at the bottom of this page. Our courteous and professional customer support team is always glad to help!